In recent weeks, there has been a lot of focus on the appreciation of the rupee against the dollar. In an opinion piece in Financial Express today, I point out that the US dollar has fluctuated considerably in the period after September 2008, and interpret the recent events on the Indian currency market. At first, in the `flight to safety' into US government bonds that came about after the Lehman shock, the US dollar gained ground. As the global financial system has gained confidence, the reversal of this `flight to safety' has meant a concomitant decline in the US dollar. These ups and downs of the US dollar have important implications for our intuition in India about the rupee-dollar rate. If we think the US dollar is roughly fixed, then the pursuit of an inflexible rupee-dollar rate can be interpreted as some kind of `stability'. But if the US dollar itself is a fluctuating yardstick, it is hard to justify efforts at RBI to obtain inflexibility of the rupee-dollar rate. When the dollar declines in value, an attempt at holding on to a rigid rupee-dollar rate is tantamount to forcing a rupee depreciation, and vice versa. Greater flexibility in the rupee dollar rate will free up monetary policy to pursue the more important goal of stabilising the domestic business cycle. But along the way, for firms to learn to live with greater flexibility of the rupee dollar rate, well functioning currency derivatives markets are required. RBI needs to first step away from the present strategy of banning most of these markets, so as to be able to move forward to greater flexibility of the rupee. On the macroeconomic arguments about the long-term decline of the US dollar, see Wolfgang Munchau in the Financial Times today. We'll soon get the announcement. Here are a few possibilities, computed by Thomson/Reuters, using citation analysis. If I had to vote, it would be a Taylor/Woodford prize. For a sense of this work, see: link, link. While inflation targeting was invented in New Zealand based on the intuition of cleanliness in public administration, Taylor and Woodford had a lot to do with being able to think straight about it. It's interesting to wonder how publicly visible citation data can be used to predict the Nobel prize outcome. One would want some kind of model which consumes citation data and comes up with an estimate of the Pr(Nobel prize). E.g. if one strong idea suffices (example: James Heckman) then it suggests certain people who will get through (example: Paul Romer). If they want you to build a broad literature (example: Robert Lucas) then that yields a different profile of those who will get through. Hmm, I can't come up with an example of another Robert Lucas. Such a modelling effort will yield insights on the usefulness of summary statistics of citation data such as the h-index and the g-index. As an example, it's easy to test which of the h index or the g index have superior predictive power in a model of predicting the Nobel prize. For an analogy, it's easy to take firm data and fit an ordered probit model which predicts the credit rating. Once this is done, you're holding a black box which is able to look at firms, and come up with a real valued measure of credit risk. In similar fashion, once a model is estimated, which maps citation data and generates a real number from 0 to 1 (e.g. the probit latent variable), then it can be applied to a full database of all economists, and yield a measure of how Nobel-like each person is. This can be easily layered into Google scholar. Most people in India think of Raghuram Rajan as being the first Indian-born economist who became the chief economist of the IMF. What is not widely appreciated is that in the class of economists of Indian origin who are younger than Amartya Sen, Raghu is the best set of papers, as measured by citations. I have a piece in Financial Express today about the deeper linkages between the failed Bharti/MTN transaction and India's problem of capital controls. The dual listing issue was, of course, not the only or even the main reason why the Bharti/MTN transaction failed. But it was an important impediment, and many interesting transaction structures could have been used if this constraint had been absent. And, the issues that I highlight in the article are applicable in a much broader range of situations. Unsigned reportage in Economic Times suggests that a few other people are also thinking similarly. Also see reportage by Heather Timmons in the New York Times. Subhomoy Bhattacharjee in Financial Express has interesting views. Also see The legal aspects of dual listings, on the blog `Indian corporate law'. For another story of Indian companies who are growing up, facing global competition, and hitting constraints of Indian public policy, see this story by Pallavi Aiyar about Jet Airways setting up their hub in Belgium. The automobile industry is an oasis in the Indian economy in terms of having high quality data. Commercial vehicles are of particular interest given that CV sales is a component of investment demand in the economy. Hence, we can learn something about investment demand in particular, and business cycle conditions in general, by looking at what is going on with CVs. 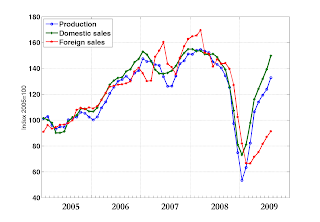 If you try to draw a graph of the time-series of CV sales, you will find that this is very noisy. And if you convert it to year-on-year growth, this is not useful since each value of the year-on-year growth is a moving average of the latest 12 one-month changes. You'll pickup what was happening in the last year, and not what is happening right now. Swaminathan S. Anklesaria Aiyar has an article in Economic Times on India's remarkable emergence as an exporter of automobiles. Mahesh Vyas has an article in Business Standard on the recent rebound in automobile production and sales. And, here's the link to the CMIE website on cars. Giovanni Veronese emailed me a fascinating graph, with seasonally adjusted data for Indian commercial vehicles. Click on the graph to see it more clearly. This is not quite comparable with the above, since it pertains to commercial vehicles and not cars. And, Indian exports are unlikely to have benefited from the US cash-for-clunkers program. All the three lines on the graph are seasonally adjusted levels, indexed to 100 for the production of January 2005. The red line is for Indian exports. It shows a very high rate of growth - a roughly 50% rise over the period from 2005 to early 2008. This is the incredible rise of India as an automobile exporter, the story told by Swaminathan S. Anklesaria Aiyar. Unlike sales of cars in the US, this has not recovered to pre-crisis levels. The green line is domestic sales. 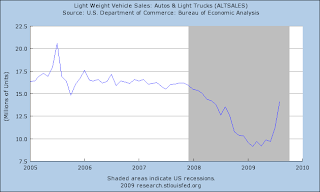 This shows a recovery similar to that seen in the US - back to the values much like those seen immediately before the crisis, but without a cash-for-clunkers program being run by the government. The blue line is automobile production. It shows savage cuts in production executed by the industry when the financial crisis appeared. This was unlike the standard script for downturns as we know them, where firms generally build up inventory when sales slow down. This time around, working capital financing in order to hold inventory was hard to find. I also think that the headlines and television dramatisation of the early stages of the downturn, accompanied by sharp movements in the prices of securities, were useful as an early warning system. This triggered off action by CEOs well before the full bad news came out through sales. As a consequence, there was very little inventory in hand, and production bounced back nicely when sales came back. If the three indexes had continued to grow as they had done pre-crisis, then all three would have been roughly at values like 200 today (i.e. one doubling ahead of the values of January 2005). Instead, we're back to the pre-crisis level or worse. Exports are just a bit more than half the pre-crisis high. In the case of production, we're at a value of 130, which is significantly behind the pre-crisis level of 150. It is really important to do seasonal adjustment, and then eyeball time-series of seasonally adjusted levels, in order to understand what is going on with these series. We've been updating a set of series every Monday morning, and releasing these as a public good.